A jet overshot a runway and skidded across several lanes of a highway in northern Italy early Friday. 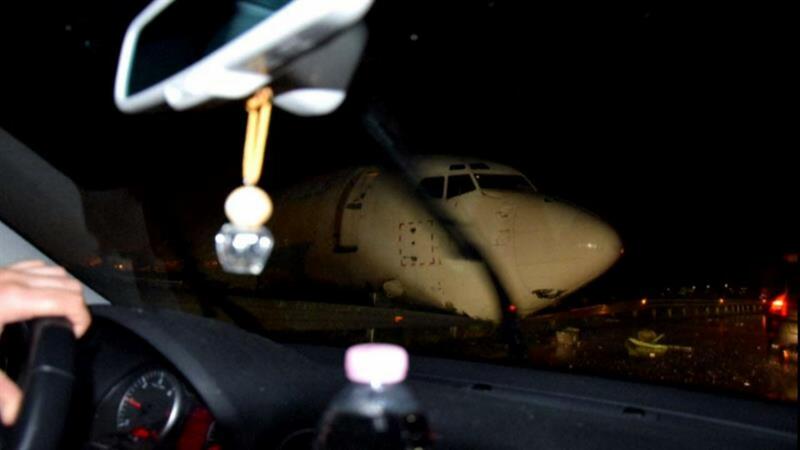 The ASL Airlines Hungary cargo plane came to rest on the road next to Orio al Serio International Airport near the city of Bergamo. The airline — which operated the Boeing 737 on behalf of courier firm DHL — told NBC News in an email that the two crew members on board were uninjured. The flight from Paris landed at about 4 a.m. local time (10 p.m. ET Thursday), according to Italy's National Flight Safety Agency. The authority said the plane "careered off the runway during landing" and that "the plane is severely damaged." The Aviation Herald reported there were thunderstorms and poor weather at the time. "The aircraft broke through the airport perimeter fence, a parking lot, a guardrail and came to a stop on [the] road ... about 580 meters [635 yards] past the end of the runway," the Aviation Herald reported. A message on the airport's website warned that delays were likely at the airport following the incident. The National Flight Safety Agency said it was investigating the cause of the incident.